In 1941, as the nation prepared to enter World War II, the citizens of Pensacola, Florida, gathered for prayer in a public park and erected a wooden cross. A cross has now stood on that site for over 75 years, and it is one of over 170 displays in Pensacola parks memorializing the City’s diverse history and culture. But in May 2016, the American Humanist Association sued the City, insisting that it remove the cross. Becket is defending the City and its historic cross, arguing that government need not purge part of its history and culture simply because some of it is religious. On September 17, Pensacola appealed to the U.S. Supreme Court, which is considering a similar case involving the Bladensburg Peace Cross, a World War I memorial in Maryland. Pensacola has asked the Supreme Court to join the two cases together and decide if historic symbols like the cross are permitted in the public square. The Court is expected to act on that request this fall. Kondrat’yev, et al v. City of Pensacola. The Becket Fund for Religious Liberty (n.d.). Retrieved from https://www.becketlaw.org/case/kondratyev-et-al-v-city-pensacola/. Kondrat’yev, et al v. City of Pensacola. (Apr. 04, 2019). https://www.becketlaw.org/case/kondratyev-et-al-v-city-pensacola/. "Kondrat’yev, et al v. City of Pensacola." The Becket Fund for Religious Liberty. Accessed [Apr. 04, 2019]. https://www.becketlaw.org/case/kondratyev-et-al-v-city-pensacola/. The City of Pensacola has a rich history older than the U.S. itself. A key seaport connected to the Gulf of Mexico, it is named after the Native American people who lived there as early as the 1100s, and it was one of the first areas to be settled by Spanish explorers. Today, Pensacola is known as the “Cradle of Naval Aviation” and is home to many members of the military. On a scenic bayou within the City lies Bayview Park, a popular location for social and civic gatherings. The 28-acre park features a senior center, amphitheater, two dog parks, tennis courts, a bocce ball court, playground, several boat ramps and docks, walking trails, picnic areas, and a memorial to a local citizen who died in a waterskiing accident. Tucked in the northeast corner of the park is the Bayview cross, a monument first erected in 1941 by the Jaycees, a non-profit civic group, to unite the community just months before the U.S. entered World War II. For over 70 years, Pensacola citizens have held community events at the monument, such as sunrise services, Veteran’s Day and Memorial Day remembrances, and other voluntary gatherings. 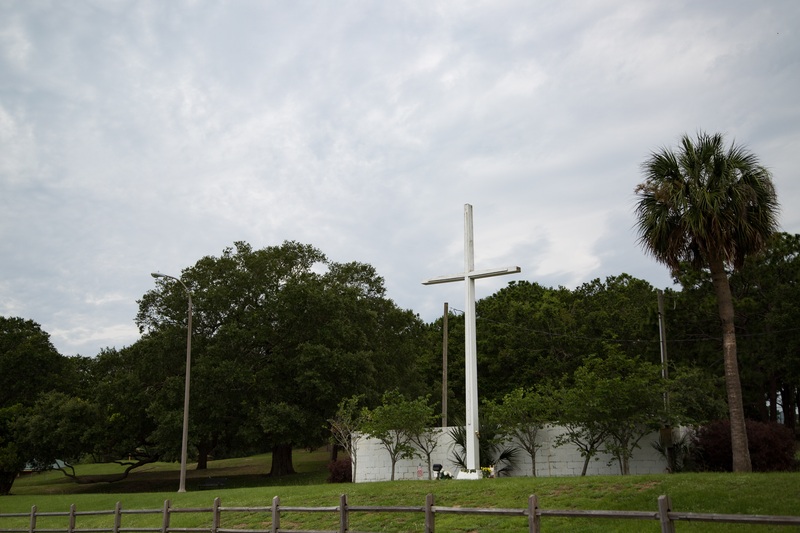 More than a religious symbol, the Bayview cross has become part of the history of Pensacola and a reminder of the many diverse groups, religious and nonreligious alike, that make the City what it is. But in May 2016, four plaintiffs, represented by the American Humanist Association, filed a lawsuit in federal court to remove the cross. Two of the plaintiffs live in Canada; one has held his own ceremonies at the cross; the fourth lives seven miles away from the park. But they all claim that seeing the cross is offensive. In June 2017, despite recognizing that the cross “is part of the rich history of Pensacola,” and that the cross “might well pass constitutional muster,” the federal court ruled that the cross has a “religious purpose” and must be removed. Becket immediately came to the City’s defense, arguing that that religion is a fundamental aspect of human culture and history, and the Constitution does not require the government to strip every religious symbol from the public square. In September 2018, the Eleventh Circuit court of appeals ruled that it was “bound” by earlier precedent to rule against the cross. But two of the three judges said the earlier precedent was “wrong” and “needs to be reversed.” They urged the full Eleventh Circuit or Supreme Court to uphold the cross. The city plans to appeal. Public Square: Because religious exercise is natural to human culture, it has a natural place in the public square. Religious symbols should not be treated as dangerous expression, scrubbed from society. Instead, the government can and should recognize the important role of religion in our history and culture.